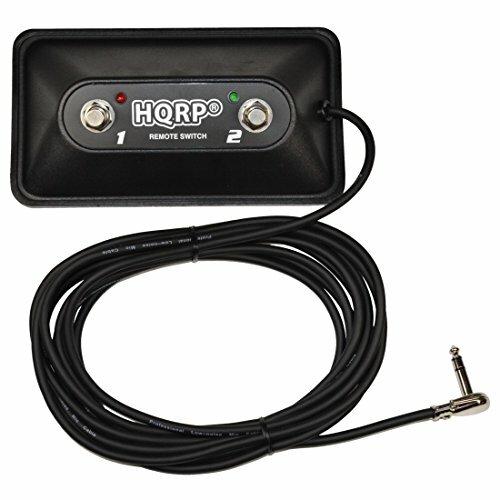 HQRP Multipurpose Dual-Channel Footswitch with LED & 1/4" plug. HQRP Footswitch is made of quality metal components (buttons, the interior parts and plugs). The molded housing guarantees the long period of use. 14' cable provides the wide usage area. Right angle 1/4" plug does not cause the bending of the cable near the connection. The footswitch has the inclined top which facilitates the push. The convenient disposition of the buttons ensures the fast and easy switch of the effects. Right angle 1/4" plug is convenient for application. The buttons are located at the comfortable length from each other. 2 LEDs near these multi-purpose buttons help to track if they are active or not. For easy use the buttons are numerated. QUALITY: HQRP Footswitch is made of quality metal components (buttons, the interior parts and plugs). The molded housing guarantees the long period of use. 14' cable provides the wide usage area. Right angle 1/4" plug does not cause the bending of the cable near the connection. ERGONOMICAL: The footswitch has the inclined top which facilitates the push. The convenient disposition of the buttons ensures the fast and easy switch of the effects. Right angle 1/4" plug is convenient for application. USER FRIENDLY: The buttons are located at the comfortable length from each other. 2 LEDs near these multi-purpose buttons help to track if they are active or not. For easy use the buttons are numerated.